Hey guys, it has been nearly 2 months since I last posted on the site. We finally got back from our 7 week trip, we both had a ball and enjoyed many highlights. The highlights for me regards gaming and history have to be the Pergamon museum in Berlin and the great Swedish Armee Museum in Stockholm. I got lots of good stuff for the period of Karl X from my trip to Stockholm; books, photos and information on flags captured in Poland during 1655/60. I have been busy looking over the army lists as well in the last 2 days and I have attempted to come up with a better model for choosing an army. Maximillian in Germany has come up with some very good id eas which I have attempted to include, such as different rules for Mercenaries, Reliable and reluctant allies etc. So far I have 5 different Polish lists; 1623-47, 1648-54, 1655-60, Rebels 1656-57 and 1661-73, I think this way the different armies can be presented in a way that reflects what was actually present. I will need help to play test these lists, so if you are interested and have access to armies drop me a line. 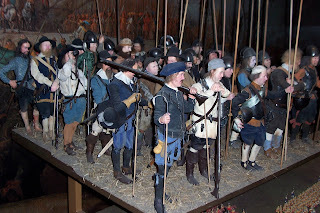 To finish today I post 2 pictures of a Swedish pike formation from the TYW period at the Swedish Armee museum (scale is 1\5th). 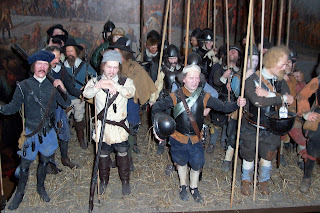 You mentioned that you obtained books, photos and info on captured flags at the Armemuseum in Stockholm on the wars of Katl X Gustav. Would you be willing to share the book titles and flag info?